Andrea Geyer is a New York-based artist, who works with photography, video and performance, using both fiction and documentary strategies in order to address larger concepts such as national identity, gender, and class in the context of the ongoing re-adjustment of cultural meanings and social memories. Geyer was born in 1971, in Freiburg, Germany. She attended basic study painting at the Independent Art Academy, Stuttgart, followed by photography and film design class at the Fachhochschule Bielefeld. Geyer got her degree in Fine Arts at the Academy of Fine Arts, in Braunschweig, Germany. 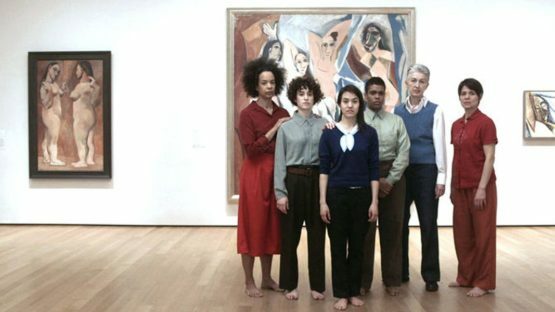 She is also a graduate of the Whitney Museum Independent Study Program. Geyer’s image and text based installations are characterized by a sort of rich calmness that draws a viewer into a consideration of layers upon layers of thought or meaning, a calmness that leads to a considered, embodied thinking on concepts such as national identity, gender, and class. Her work addresses the construction and politics of time in the intersection of politics, culture and history. With a particular focus on women, her works engage specifically potent social and political situation, events and conditions and create spaces of critical, collective reflection on the politics and ideologies of temporal translations. Number of versatile projects represent her artistic expression. Through her works, Geyer offers a veritable blow-by-blow of political and social emergencies from the 2000s, in addition to more anachronistic socio-political problems and events that her work confronts. In her photographic project, Spiral Lands, the mythologized land of the American Southwest is demythologized by the doubling of photographic images that make one question the representation of natural spaces haunted by colonial violence and primitive accumulation. The miniscule differences in these photographs act as traces, opening the land to encounters beyond the transcendentalism of the genre originated by Ansel Adams and others. In Comrades of Time, seven of Geyer’s friends reenact writings and correspondence from the era of the Weimer Republic. Seven women recite monologues composed from speeches, letters, and essays from 1916 through 1941, written by architects, writers, philosophers, and political organizers from those vibrant years as a kind of cultural echo – an experience of historical times as they are brought to the present. Geyer’s work has been shown at The Museum of Modern Art, the Whitney Museum of American Art, Apex Art, and Artists Space, in New York City, the Stedelijk Museum, Amsterdam, RedCat and LACE, in Los Angeles, Tate Modern and Serpentine Gallery, London and many other venues. Andrea Geyer lives in New York.